Nestled in the heart of Bukit Merah, the Gateway Theatre is a flourishing new hub for the creative and performing arts. Completed in 2017, the multi-theatre venue built by the Faith Community Baptist Church replaces the former three-storey Touch Community Theatre. The Gateway Theatre aims to foster an appreciation of the arts by making the arts accessible to all walks of life and exposing the community to performances of various sizes, genres and styles. Designed by architectural firm Ong & Ong, the S$50m nine-storey Gateway Theatre diverges from the conventional separation between formal and informal spaces. The spatial planning of the building purposely caters for community interaction and incorporates plenty of inviting spaces. A harmonious flow between performance and community spaces lends a creative dynamic to the building. Since its opening, the Gateway Theatre has headlined made-in-Singapore acts, organised arts outreach programmes for children, provided a platform for emerging artists to showcase their talent, hosted photography exhibitions and more. The Gateway Theatre encompasses a Main Theatre, a Black Box Theatre, a Dance Studio and seminar rooms, with a total capacity of approximately 2,500 people. The keystone venue is the 920-seat Main Theatre, a centerpiece for creative expression. The two-tiered, multi-purpose performing space features a 12m x 6.45m LED wall, a moveable orchestra pit, a 10m stage and a stage lift. It is fully equipped with backstage technologies, including visual, audio and lighting systems that can cater to the needs of various performing art forms. A unique feature of the Main Theatre is the undulating wall design, which features a series of boxed cut-outs that seem to resemble the branches of a tree. From an acoustics perspective, the distinctive walls posed a challenge. It was important that the acoustic panels chosen for the walls could blend in with the design and also offer a quality acoustic performance. The acoustic panels had to fit the curved and contoured lines of the wall design. The material for the panels also had to optimise the physical acoustics of the theatre and enhance the sound quality across the room, by absorbing sounds and optimising reverberation. The StoSilent Distance panels offered the right fit for the Main Theatre, in terms of both design and performance. Covering a wall area of 1050m2, the panels were able to provide the right acoustical characteristics for theatrical performances, musical concerts and other production staged in the theatre. Made of expanded glass granulate, the sound-absorbing material of the acoustic panel was able to retain the acoustics of the room. By softening reverberations, the panels could project better sounds and improve clarity in the theatre. The design flexibility of StoSilent Distance also made installation a seamless process, as the suspended acoustic panel system proved to be most suitable for curved surfaces. Because of its versatility, the StoSilent Distance board system could be adjusted to any shape or form. The panels could be curved and cut to accommodate the exit doors located at various points of the theatre. To provide a smooth finish, the wall panels in theatre’s lower tier were trowelled with StoSilent Top Basic and StoSilent Top Finish. This created an ultrafine, shimmering surface. 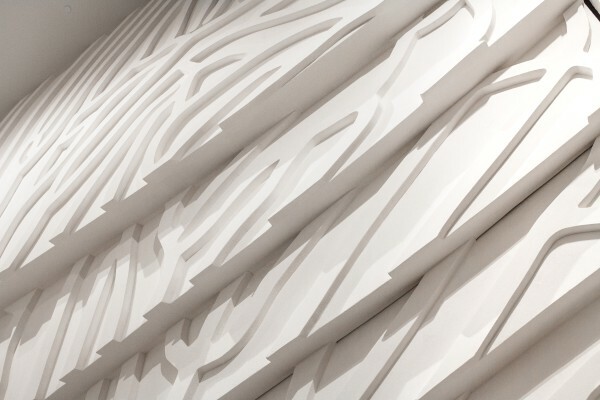 Meanwhile, the wall panels in the theatre’s upper tier, which contained the branch-like cut-outs, were spray plastered with the textured thin layer of StoSilent Décor M. The natural white finish of this top coat complemented the clean palette chosen for the theatre. The Main Theatre is a prime example of a successful collaboration with the architect in achieving the right acoustical outcome for the space while preserving the integrity of the design. Sto’s range of acoustic products, with its ability to achieve a seamless look, played a vital role in helping the architect fulfill its design vision. Sto’s seamless acoustic solutions can deliver the best audible experience and can be incorporated not just in performance venues such as theatres and concert halls, but also in other building areas such as atriums and more. With Sto’s wide array of acoustic products, it is able to offer architects, applicators and contractors reliable solutions to meet the unique requirements of projects of all sizes, big and small. It's hard to imagine modern architecture without large, even, white surfaces. The StoSilent Distance board system allows the seamless and soundabsorbing design of walls and ceilings, which have to be suspended, for example, to reduce the room height. The room concept is thus retained with good acoustics included.